Habesha Cement Job Vacancies 2019-2020: Habesha Cement has recently publish an advertisement notification for Senior Cost & Budget Accountant, Cost & Budget Accountant, Lead Instrumentation Technician, etc. jobs opening for Feb. 2019. Habesha Cement would like to invite qualified candidates for the following position. Qualification:- BA Degree in Accounting / Accounting and Finance / Financial Management or related discipline & BA Degree in Accounting / Accounting and Finance / Financial Management or related discipline & BSc in Electrical Engineering or other related discipline & Advanced Diploma / Diploma Level IV OR 10+3 in Electricity / Instrumentation or other related disciplines & BA in Supplies Management and Logistics, Marketing or other related disciplines. Interested applicants who fulfil the above requirements can submit their application, CV and non- returnable copies of their testimonials in person to HRM & Admin Department located at Wello Sefer to Gotera / Ethio-China Friendship Street, Kasma Building 8th floor, in front of Wengelawit Building OR Holeta Plant site until February 11,2019. Incomplete documents are not acceptable. Habesha Cement Job Vacancies 2018-2019: Habesha Cement has recently publish an advertisement notification for Mechanical Engineer II, Environmentalist, Welder jobs opening for Dec. 2018. 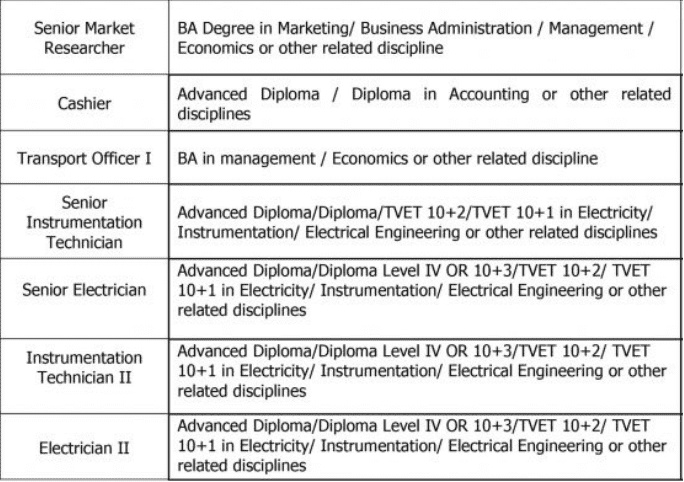 Qualification:- BSc in Mechanical Engineering or other related disciplines/ BSc Degree in Environmental Science or other relevant discipline & Advanced Diploma/ Diploma Level IV OR 10+3/ TVET 10+2 / TVET 10+1 in General Mechanics / Machine Technology / Welding or other related discipline. Interested applicants who fulfil the above requirements can submit their application, CV and non- returnable copies of their testimonials in person to HRM Department located at Wello Sefer to Gotera / Ethio-China Friendship Road, Kasma Building 8th floor, in front of Wengelawit Building until January 1/2019. Incomplete documents are not acceptable. Habesha Cement Job Vacancies 2018-2019: Habesha Cement has recently publish an advertisement notification Cashier jobs opening for Dec. 2018. 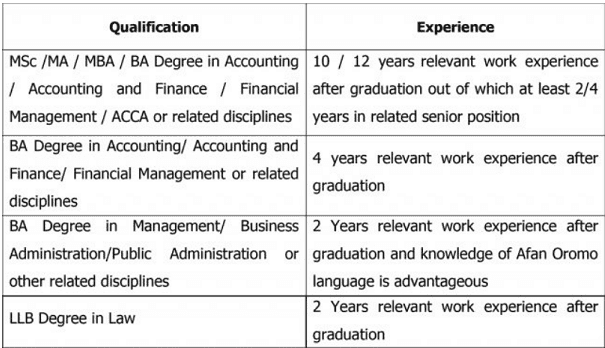 Qualification:- Advance Diploma / Diploma in Accounting or other related disciplines & 3/4 years relevant experience. Interested applicants who fulfil the above requirements can submit their application, CV and non- returnable copies of their testimonials in person to HRM Department located at Wello Sefer to Gotera I Ethio-China Friendship Road, Kasma Building floor, in front of Wengelawit Building until December 25/2018. Incomplete documents are not acceptable. Habesha Cement Job Vacancies 2018-2019: Habesha Cement has recently publish an advertisement notification for ERP Officer II & Cement Mill Superintendent jobs opening for Nov. 2018. Interested applicants who futful the above requirements can submát their application, CV and non-returnable copies of their testimonials in person to HRM Department located at Wello Sefer to Gotera / Ethio-China Friendship road, Kasma Building 8th floor, in front of Wengelawit Building until November 23, 2018 Incomplete documents are not acceptable. Habesha Cement Job Vacancies 2018-2019: Habesha Cement has recently publish an advertisement notification for Senior Accountant, Senior Cost & Budget Accountant, etc. jobs opening for August 2018. Building 8th floor, in front of Wengelawit budding until September 4/2018. Incomplete documents are not acceptable. Habesha Cement Job Vacancies 2018-2019: Habesha Cement has recently publish an advertisement notification for Senior Market Researcher, Cashier, Transport Officer, etc. jobs opening for July 2018. Interested applicants who fulfill the above requirements can submit their application. CV and non- returnable copies of their testimonials in person to HRM Department located at Wello Sefer to Gotera / Ethio-China Friendship Street kasma Building 8th floor, in front of Wengelawit Building until July 13/2018. Incomplete documents are not acceptable. Habesha Cement Job Vacancies 2018-2019: Habesha Cement has recently publish an advertisement notification for Internal Audit & Inspection Service Head, Auditor I, HR Officer, etc. jobs opening for June 2018. Last Date:- 23rd June 2018.